Q: I don't see a groups feature in Mail. Where can I find it? A: Unlike other email programs such as Microsoft Outlook, Apple’s Mail doesn’t contain its own contact manager. Rather, it gets its contact information from Apple’s Address Book application. Because it does, when working with groups, you start with Address Book. 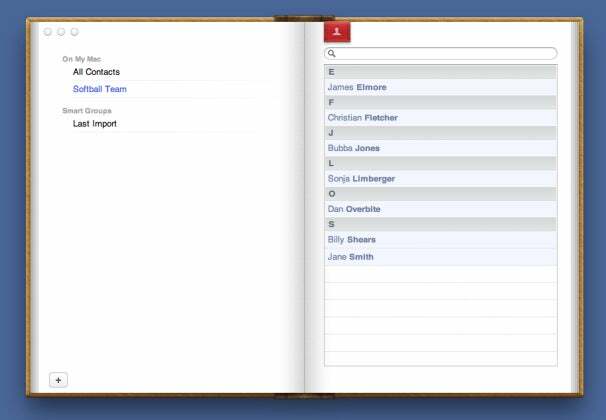 To do that, launch Address Book and, by default in Lion’s version of Address Book, you see an All Contacts page on the left side of the window and all your contacts listed to the right. To create a new group simply click the Plus (+) button at the bottom left corner of the Address Book window. Address Book will create a new group called Untitled Group. Just enter a new group name such as Softball Team and press the Return key. Now select the All Contacts entry at the top of the group list to expose all your contacts. Drag any contacts that belong to your softball team into your new group. When you do, you’ll see an icon that looks like a small note card with a red icon containing the number of contacts you’ve selected. These contacts are now part of your group. They remain part of your All Contacts group as well. Create a group in Address Book so you can use it when you're composing messages in Mail. Here I've created one for the members of the softball group. Alternatively, you can select contacts from your All Contacts list (hold down the Command key to select non-contiguous entries) and choose File -> New Group From Selection. A new untitled group will be created that contains these contacts. Rename this group as you like. Q: Are there any easier ways to make a group? A: Before leaving Address Book, explore one other option—Smart Groups. If you routinely send messages to all the people you work with, for example, there’s a good chance that a smart group can help you. Choose File -> New Smart Group and in the sheet that appears, enter a name for the group—Co-workers, for instance—and then in the field below, configure the entry to read Email Contains domainname where domainname is the name of your company email address. In my case, for example, I’d enter macworld.com. That group will now contain all contacts that have a macworld.com address. You can use smart groups for a variety of things—contacts that live in a particular zip code or use a specific area code, contacts that you’ve tagged with a note of one kind or another, or people who share a birthday. Q: Most of my contacts have more than one email address. Can I choose the one I want the group to use? A: Regardless of how you create your group, make sure that you send your messages to the correct email address for each recipient. So, for example, if a couple of co-workers are also members of your softball team, you can use their work email addresses as part of your Co-worker group and their personal email addresses for the Softball Team group. You do this through Address Book's Distribution List feature. In Address Book choose Edit -> Edit Distribution List. In the window that appears, select your group and check the names that appear to the right. You may find some that have more than one email address. Highlighted addresses are the ones that will be used by that group. To switch to another address for an individual, simply click on an alternate address. An On My Mac entry will appear in the Groups page. Select the All On My Mac group and click the plus-sign (+) button at the bottom of the page to add a group. (You needn't put anything in this group if you don't want to.) The Edit Distribution List option will now be active. When you select it you'll have the option to work with groups on your Mac as well as those stored in iCloud. Once you've done this, you can return to Address Book's preferences and, in the General tab, choose iCloud as the default account, thus ensuring that any new contacts you add will be synced with iCloud and the devices you sync with it. Do some of your contacts have more than one address? You can choose which address to send messages to by using Mail's Distribution List feature. Q: Once I make a group in Address Book, how do I use it in Mail? A: Now that you’ve created the groups you need, launch Mail and create a new message. In the To field, start typing the name of one of your groups. As you do, Mail will present a list of contacts and groups that match your query. Select the group name you want and press the Return key. By default, Mail will add all the recipients that belong to that group. If you’d like to see just the group name, choose Mail -> Preferences, select the Composing tab, and in the Addressing area disable the When Sending to a Group, Show All Member Addresses option. Close the preferences window and you’ll now see only group names when you add them. Start typing the group name in Mail's To field to see it as one of the choices. Another way to accomplish this is to choose Window -> Address Panel and in the Addresses window that appears, double-click on the group you wish to send the message to. It will be added to the To field. Q: Can I use a group to address a message but leave out a member or two? A: Suppose you want to send your message to only certain individuals within the group. (For instance, if you're planning a surprise party and don't want the birthday boy or girl to find out.) You can easily do this as well. If the group name appears in the To field, hover your cursor over it and click on the downward-pointing triangle that appears. In the resulting menu select Expand Group. Now, all the contacts within that group appear in the To field rather than the group name. Select a contact that you don’t want the message to go to and press the Mac’s Delete key. Regrettably you can’t use the Command key to select multiple contacts in the To field. In the To field, click on the arrow next to your group's name. You'll see a number of options, including the choice to expand the group, in other words, show all the email addresses of its members. Another option is to winnow down the group before adding its members to the To field. To do that, once again expose the Address Panel, select a group, and Command-click on those contacts you want to send the message to. Double-click one of the highlighted entries and any contacts you selected will be added to the To field. If you find that you wish to address a message to just a couple of individuals in a much larger group, you’ll find it easier to simply enter their names separately. So, rather than entering the Softball Team group, enter the short-stop and pitcher’s names as individual contacts. Q: Are there any other ways to address a message to a bunch of people? 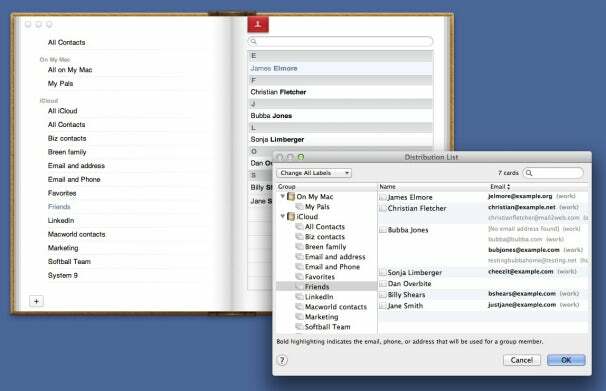 With both Address Book and Mail open, you can select multiple contacts in Address Book and simply drag them into a mail message’s To field. Or you could select contacts in Address Book and drag them to the desktop, where those contacts will be encased in a single vCard file, which you can drag into a To field whenever the mood strikes. Another option is to create a text shortcut that contains the email addresses of all the members of your group. Q: Do I really have to use Address Book to do this? A: If you don't want to use Address Book, you can instead tap into OS X’s text substitution powers to create a group. 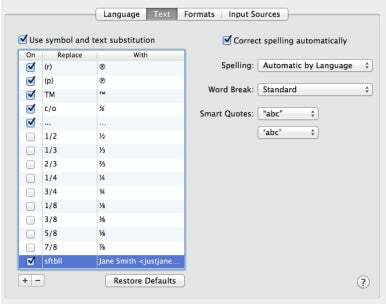 Launch System Preferences, choose the Language & Text preference, and click the Text tab. It’s within this tab that you create text shortcuts. Just click on the Plus button at the bottom of the window to create a new shortcut. In the Replace field enter something like sftbll. In the With field, enter the email addresses for those you want to associate with your sftbll shortcut. When you want to add those addresses to a message, just type sftbll into the To field, followed by the Return key, and OS X will autofill the To field with the email addresses you associated with that shortcut. Commercial utilities such as Smile’s $35 TextExpander, Ettore Software’s $20 Typeit4Me, and Ergonis’ €30 Typinator can do the same kind of thing (and a lot more). Regardless of which solutions you choose, taking the time to clump together those contacts that you routinely send messages to will make managing your email far less tiresome.